Darren says: It’s been a big week here at ProBlogger as we’ve worked through a series of posts exploring the topic of monetizing blogs through creating products. I hope you’ve found it helpful and feel equipped to create your next product. Today in a final instalment from Shayne and myself (we do have one more post in the series tomorrow though), we look at what to do when you’ve finished your product and move into launching it. Without this final piece to the puzzle, we just have a great product – but nobody ever buys it. I hope you find this useful! At a recent Problogger Event, I presented a session on how to launch product in the style of a ‘countdown’. As it’s product week, and you’ve already prepared, picked, and constructed your product, it’s time to launch. So, today I’m sharing the countdown with you. I always suggest you do a mini-product launch on someone else’s product as an affiliate before you do your own. Find a good affiliate product and revolve your practice launch around it. If you want to be a bit strategic, pick the product of someone who’s experienced and successful with their own launches. Reach out to them and let them know what you plan to do and ask if they have any advice – they’re likely to give you some pointers that you can then fold into your own launch. Darren says: Shayne is spot on with this tip. In 2009 when I launched my first eBooks I had never launched a product of my own before but thankfully I had already done a number of promotions of other people’s products as an affiliate. By doing this launch, I made some money from my affiliate commissions – but the real ‘profit’ in the exercise was that I learned more about how to run a launch for my own products. I learned what marketing worked and didn’t work with my audience, I learned about writing sales copy, I learned a bit about the price point my readers would buy at, etc. You need to set a date and try your best to stick to it. Pick a date that works for you, but also your readers (think about things like holidays, seasonal activities and events that might take their attention away from your launch). Also, think about the time of day and choose one where most of your readers will be online (we tend to launch as our audience in the US are getting to work). If you’re someone who needs some accountability for motivation, let you readers know the date ahead of time. This way if you don’t hit it, you’ll be disappointing them as well as yourself! When you go into launch mode, you need to shut off product creation mode. Your product is done and finished and cannot change unless something drastic happens. You need to stick to this, because if you are continually tempted to go back and change your product, your launch will suffer or worse – not ever happen at all. It’s time to stop thinking about your product and sell what you have. With all my launches I like to pick the ‘angle’ I’ll take in my marketing nice and early. By ‘angle’, I mean the one key point that I will emphasise in marketing the product throughout every part of the campaign. Your angle should be a benefit (not a feature), and ideally it will encompass your unique selling point that we identified when you first decided to create this particular product. Darren says: This is something worth spending some time on. Every time we launch a product, this is one of the key things that Shayne and I debate and experiment with in the lead up to a launch. Sometimes the angle comes to us really early and easily, but many times it only finally clicks as we start writing our sales copy – and only then after we’ve written a number of versions of it! One tip that I’ve found helpful when looking for the angle to take is to think about how you can test it with your readers beforehand. I’ve been known to ask questions on our Facebook page or Twitter to try to get inside the heads of my readers. I’ve also run polls on the blog at times that test two alternative ideas to see what connects most with readers. Also sometimes the ‘angle’ comes simply by brainstorming with friends. 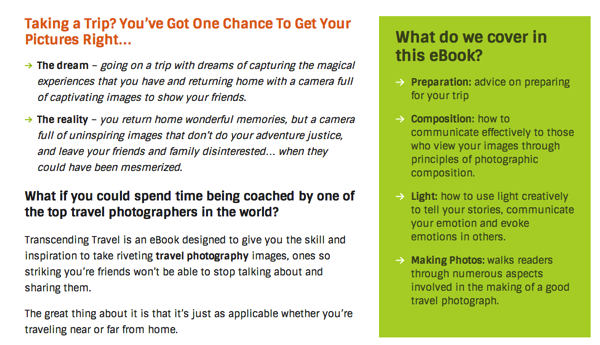 For example when I launched our Travel Photography Ebook, I emailed a few friends for feedback on the sales copy that I’d written. Jonathan Fields came back with the suggestion that I think about that feeling of regret that people get when they come home from a trip and realise their photos don’t live up to the experience they had. Once I had the angle sorted, the rest of the sales copy flowed. At the time, this eBook became the biggest seller we’d ever had. I’m not a super-detailed planning guy, I like to go with things as they come more often than not. However, I do make exceptions with new product launches. Detail down all the things you need to do with your launch. Your emails, your blog post, any advertising you might activate, guest posts you might do on other people’s blogs, affiliate communications, etc. A launch that goes to plan is a busy time. A launch that hits it out of the park, or doesn’t go well, can be crazy time. A plan will give you comfort. Darren says: For me a ‘plan’ comes in two parts. Firstly there’s all the detailed things that need to be done. These logistical things might include setting up the shopping cart, writing sales copy, emailing affiliates, etc. The other part of it is thinking about the ‘flow’ or ‘sequence’ of marketing communications you want to do. 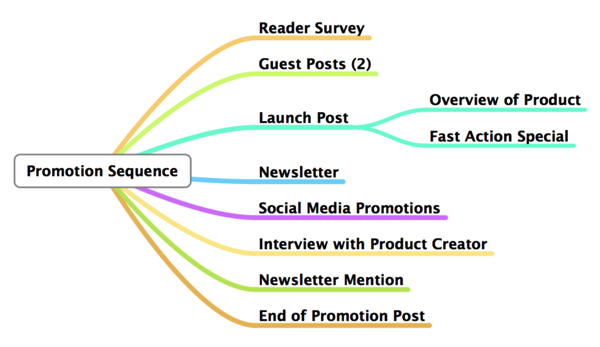 Thinking ahead of time about the sequence is worth doing because it means you’ll create a launch that takes your readers on a journey and which creates momentum – rather than just sending out random sales communications. When you do a launch it can be a real buzz and you can easily get very caught up in the moment and start communicating with your readers A LOT – too much, in fact. This was only my fourth eBook, so the launch was quite simple. We’ve now evolved the process quite a lot, but you can see here that ahead of time I’d planned to take my readers on a bit of a journey. I started off by surveying/polling my readers about their experiences with travel photography (I did this in a poll in a post in which I hinted there was an eBook on the topic to come). This warmed up my readers and also helped me to get inside their heads on the topic (which helped shape the sales copy). I then featured two guest posts on the blog from the author of the eBook. This again got my readers thinking about the topic and more familiar with the author. The launch post and sales email (which went up simultaneously) on the blog gave information on the product and mentioned the fast action special (a discount). Next they got their normal weekly newsletter – which mentioned the eBook gently. Through all this time there were a number of social media updates (on launch day there were a few but on other days no more than one a day). Then I ran an interview with the author as a blog post – again to show who he was and show off some of his photography. Then was another mention in our newsletter (not a hard sales email). Then we did a blog post and final email telling readers that there was 48 hours left to take advantage of the early bird special. This was a three-week launch. Readers got two sales emails and blog posts, but a variety of other less sales content as well. Our launches today typically go for four weeks now, and we generally email 3-4 times in that period – but again we design the sequence to add value to readers and take readers on a bit of a journey. Before you launch, you should start to get both your audience and your network ready. You’ve hopefully been building them long before the launch to get them ready for what is to follow. Give then sneak peeks, play some games, get them excited. The general rule of thumb is give as much information to get them familiar with the product, but not enough as to allow them to make a decision on if they will buy it or not. I encourage you to make sure your ability to both collect money and fulfil the product is rock-solid. There is nothing more frustrating to me than having a reader who wants to give me money, and due to a technical break down, can’t. Worse still – they have given me their money and I am not living up to my side of the bargain and delivering the product! So buy your own product: test it on mobile, on different browsers, and using all the payment options you have available. Involve others in this process too as they might find other issues than you. Make sure you can track everything that’s happening on your product pages. Get Ecommerce tracking enabled in Google Analytics, at a bare minimum. This will feel like work for no reason at the start, but when you launch, and you’re trying to figure out what’s happening you’ll be glad you did. You also might want to make sure you can quickly run some a/b tests if you need to change things up and that you can update your sales page at a moment notice. Your launch will unfold in real time and delays will cost $ $ . Now it’s time to focus on your sales copy. You’ve got your angle set above and you now need to start pushing that into copy for your sales page, blog posts, emails, affiliate communication, social messaging and advertising. This is the one thing I’ll allow you to be a perfectionist with. Make sure you spend a good amount of time writing, editing and proofing everything. Also note that Shayne’s Blogger’s Guide to Online Marketing has more information on this topic including a number of sales page templates and example sales copy emails. My last note on sales copy is that you’ll get better at writing it the more you practice. My first attempts at sales pages were pretty simple and not overly successful. As a result I involved others in the process of editing and shaping them – but in time you DO improve and you also begin to see what readers do and don’t respond to. When I’m launching, I’ll tend to run someone else through what I’m planning to do for my launch. I get them to eyeball the sales page, do a quick test transaction, and collect feedback along they way. When they say “I think you’re good to go”, that’s when I hit the button. It’s time to launch and it’s all happening. You make your sales page live, and it’s all real. I tend to do some mild social sharing first (before sending an email or pushing out a blog post), in hopes of getting that first validating sale through, but once I have that, I pull the trigger on everything else. Expect a whole raft of emotions, expect a sleepless night before, and a late night on the day. But get ready to have some fun, and of course, a whole heap of sales! You’ve launched and it’s a great feat but it’s only just the beginning. You should be thinking in terms of a “launch month”, not just launch day, and have a whole raft of activity planned to support your longer launch. Darren has shared above some behind-the-scenes activity of a Digital Photography School launch that should give you some insight into what we do. For #3, I’ve been in both situations where we’ve either stopped a launch in the first week because we’ve missed the mark (and it was never going to change), as well as adjusted the messaging and completely kick started the launch again. I personally hope it’s #1 for everyone, but if you do find yourself in trouble, you need to be prepared to do something about it. Darren says: There’s nothing like launching a product to give you a roller coaster experience of different emotions and diverse set of challenges and experiences. I try to go into a launch confident but holding loosely to expectations. The reality is that some work well, others exceed your expectations and others flop. If you go in holding too tightly to your expectations you could be setting yourself up for a fall and then you’re not in a great place to ‘pivot’ as Shayne suggests. If things don’t look like they’re going to plan I highly recommend giving things at least a few hours (if not 24 hours) to settle (unless you’ve made some huge mistake that you can fix). I find giving things 24 hours means you can do some analysis of why things might not be working, some testing of the different elements of your sales process (checking if sales pages are loading, shopping carts are working etc) and also hopefully you’ll get some reader feedback too. If you don’t get feedback – seek it out. Email some readers, get advice from friends or other trusted bloggers. The other factor to keep in mind is that once you’ve got your product created you’ve created an income stream that hopefully will grow in time over the long tail. While you may not have had a huge rush of sales at launch hopefully you can continue to see sales for many months and years to come! Lastly – if your product does go well, this is a great time to start thinking about your next steps (and potentially next products). Pay particular attention to how your readers are reacting to the product. What do they like that you could perhaps build upon for next time? What do they keep asking for or say is missing that you could do as a followup product or add to it to make it better? Numerous times we’ve seen something in launching one product that triggers an idea for our next one – so don’t get so immersed in your launch that you lose site of the bigger picture!